With the variety of channel and pricing options now available to customers, understanding and predicting their shopping behavior is simultaneously more challenging and more critical to your bottom line. Merchandising Insights Solution from IBM gives you deep behavioral insights into your customers' shopping patterns, allowing you and your trading partners to improve the effectiveness of your marketing initiatives and merchandising plans. 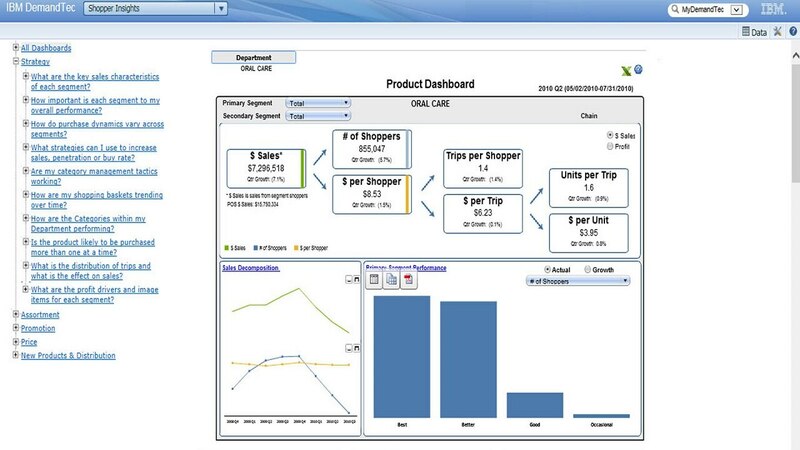 Use dashboards and shopper analytics to improve your marketing planning and to adjust pricing or promotions. Our dashboards and basket-level analysis help you answer what shopper segments are growing and in which categories, how are shoppers switching between products and who is leaving the category and why? You control the sharing of your analytics and dashboards within your team and with your trading partners through our cloud interface.